Weather is a common subject in the British culture and it’s pretty useful to teach weather vocabulary at the beginning of the course as it’s something your students can practice regularly. 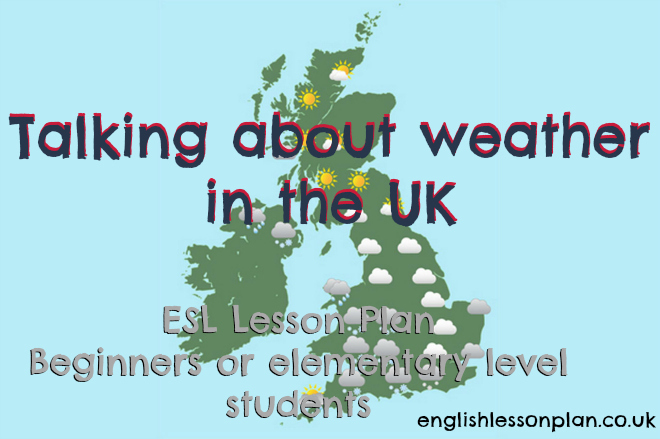 In this EFL lesson plan you help your learners talk about weather using future ‘be going to’ for predictions. During the lessons students will have plenty of opportunity to speak and listen. It’s the ESL lesson plan based on one of the units from the NEF beginner course-book. Show this map and ask students what it represents. Possible answers: England, the UK, Ireland. Explain the this is the map of the United Kingdom of Great Britain and Northern Ireland. Show the boarders. Later add the the UK consists of 4 parts (elicit the parts and at the same time show on the map) England, Wales, Scotland and Northern Ireland. Show the map in colour. At this point you should also teach the cardinal directions (north, east, south, and west, as well as their initials: N, E, S, W). As concept check questions e.g. Is Wales in the north of the UK? Is Scotland in the east of the UK? etc. 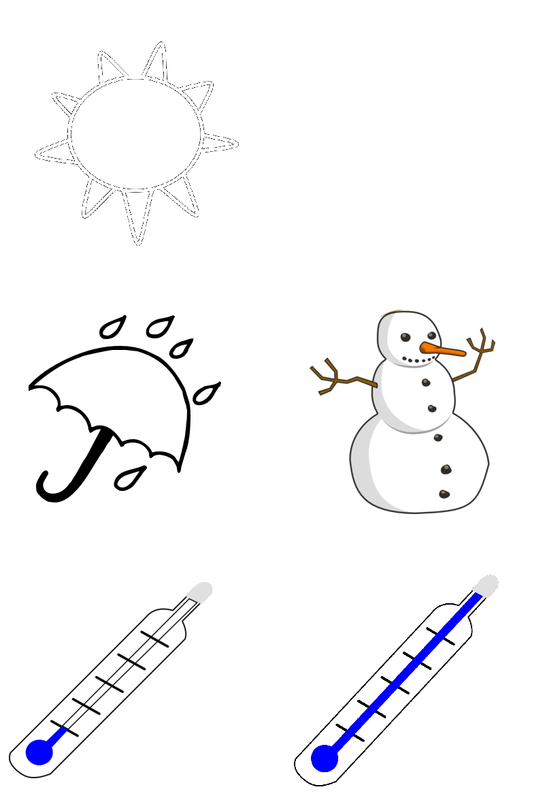 Otherwise, print out the weather symbols and introduce these to your students ( vocabulary such as: rain, snow, hot, sunny, cold, sunny). What’s the weather in the north of Scotland today? Possible answer: It’s sunny in Scotland today. What’s the weather in the south of England today? Possible answer: It’s cold in the south of England today. Now, erase the word today and replace it with tomorrow, explain the word weather forecast. .
It’s going to be sunny in the north of England tomorrow. It’s going to rain in the north of the Northern Ireland tomorrow. It’s going to snow in the east of Wales tomorrow. It’s going to be cold in the west of Scotland tomorrow. It’s going to be hot in the north of Wales tomorrow. What’s the weather going to be in the … north of England …… north of the Northern Ireland……. etc tomorrow? Are we 100% sure about tomorrow’s weather? If you’re in possession of NEF beginners- please go to p. 68 and do Ex 1c) – grammar and later to the writing and speaking activity that’s below. Otherwise distribute a small map (worksheet Ex.2) and ask students to draw 4 weather symbols on the map. Allow 1 min, later learners should write the weather forecast for the UK based on the symbols. Allow 4 mins for the writing, walk around, monitor closely. Go back to the map on the board. Place a weather symbol and elicit sentences about the tomorrow’s weather. Repeat few times. You could moderate by asking questions or getting one of the students place the symbols instead. Distribute new set of maps ( worksheet Ex.3), these time two maps per person. Within map A students draw 5 weather symbols in different parts of the UK. Divide students in pair, they should present the forecast according to their drawing, the other student listens and draws symbols accordingly. Follow- up B – young learners- Play the youtube video and do Ex.4 and 5 from the worksheet.